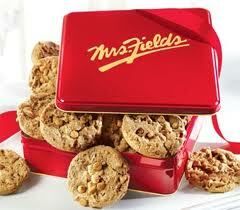 A Unique concept which has now gained as innovative marketing strategies for companies to cross promote products which are complimentary to each other .Mrs Field's is one of the premier chain offering cookies and baked goods to 390 outlets in United States and 80 bakery chains world wide . Mrs. Field’s Australia has signed a Memorandum of Understanding with New Zealand Natural Ice Cream to develop co-branded stores in Australia. Mrs. Fields Australian Managing Director Andrew Benefield announced the deal alongside David Foreman, the General Manager of Emerald Foods which owns New Zealand Natural. According to Benefield, the product synergies between the two brands made it a logical partnership. “I believe that co-branded outlets still need to have an offer that makes sense to consumers. Cookies and Ice Cream are a natural fit,” he said. The new combined operations would also be instrumental in helping the franchisee smooth the daily and seasonal sales curve, according to Benefield. Continuously improving sales and the profitability of the franchisee is vital to the success of both companies moving forward, Benefield added.